Eilat is the southern resort and port city in Israel. Nearby, on the Jordanian side, was the location of Eloth, a major ancient city for 3,000 years, which included King Solomon's sea port of Etzion-Geber. 1 Kings 9 26: "And king Solomon made a navy of ships in Eziongeber, which is beside Eloth, on the shore of the Red sea, in the land of Edom"
Eilat, the southern modern city of Israel, is a favorite holiday resort. 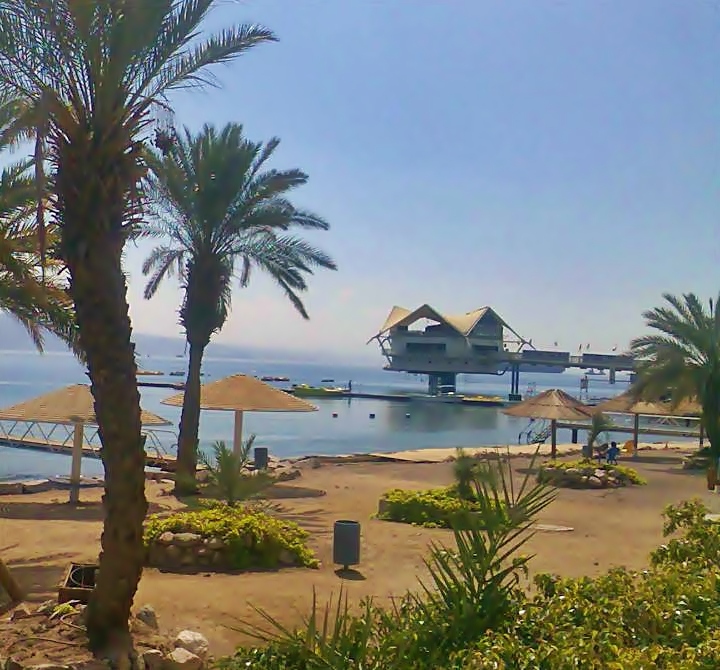 Eilat was an important city for the past 3,000 years due to its access to the red sea, its location on the major trade routes, and being a border city. Its ruins are located on the shores of the neighboring Jordanian city of Aqaba. In ancient times its nearby port, called Etzion-Geber, was the base of the fleet of King Solomon and the Judah Kings, who traded with Ophir. 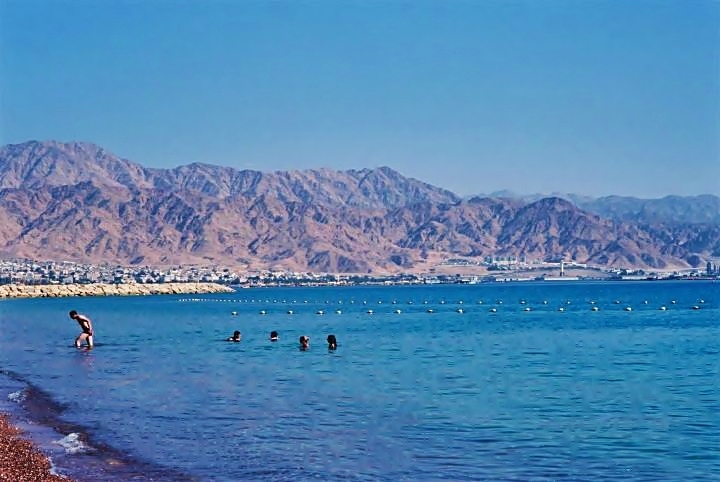 Eilat is located on the south corner of Israel, bordering two countries - Jordan on the east and Egypt on the south and the west. An aerial photo of the bay of Eilat and the area around the city is seen below. 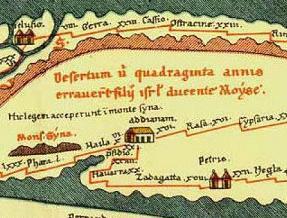 The Peutinger Map (Tabula Peutingeriana) is a medieval map which was based on a 4th C Roman military road map. The map shows the major roads, with indication of the cities, and geographic highlights (lakes, rivers, mountains, seas). The roads are shown as brown lines between the cities and stations. Along the links are stations and distance in Roman miles (about 1.5KM per mile). In the section shown on the right is the area of Eilat, drawn in a rotated direction (Egypt on the left, the Mediterranean sea on the top, and Jordan on the bottom). Eilat is marked as "Haila", and three roads pass here - to Jerusalem (to the right), through Petra to Damascus (bottom), and to Egypt via Mount Sinai (to the left). 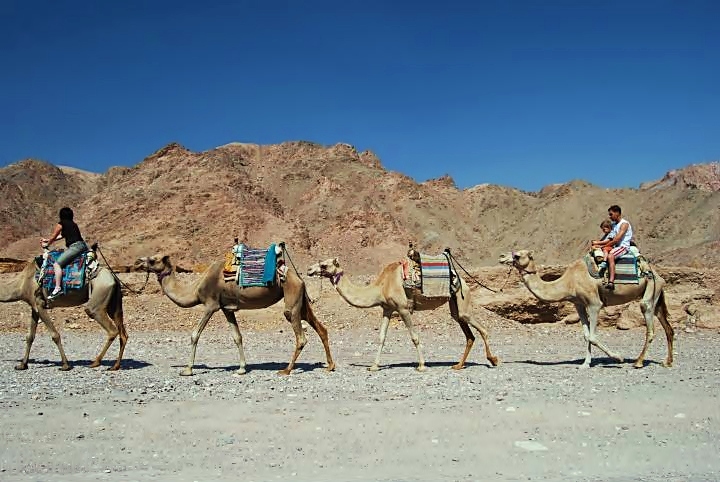 Sinai desert is marked as the place where the Israelites wandered 40 years, and Mount Sinai as the place where they accepted the laws of Israel. The modern city of Eilat (established in 1950) is located on the north-west side of the Bay of Eilat. Its major income is based on tourism, and its fine hotels offer year round sunshine and beach access. The photo below shows a view of the beach, hotels on the right, the residential section on the left (west), and the colorful mountains in the background. The Bay of Eilat and the Red Sea is seen in photo below. The city across the bay is Aqaba, the port city of Jordan and the location of the ancient city of Eloth and its port Etzion-Geber. Along the beach of Eilat is the modern port. On the south side of the port, closer to the Egyptian border, are several tourist attractions - a nature reserve of the coral reef, the underwater Observatory marine park, and the Dolphin reef park. 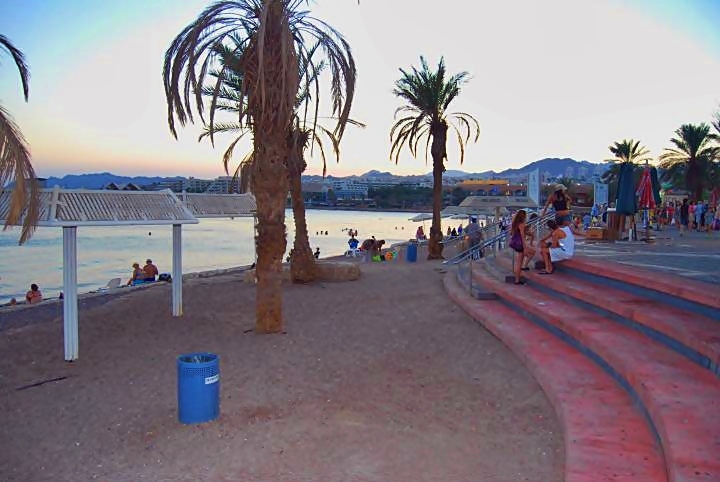 Along Eilat's beach is a long boardwalk, as seen below. Umm Rash-Rash was a small British police station that operated on the north-west side of the bay during the years 1940-1948. On March 10, 1949 the Israeli forces reached the station and raised the Israeli flag, establishing the Israeli control over the south most city in Israel. The soldiers arrived here after traveling the desert from Beersheba in the last military operation of the Israeli Independence war. 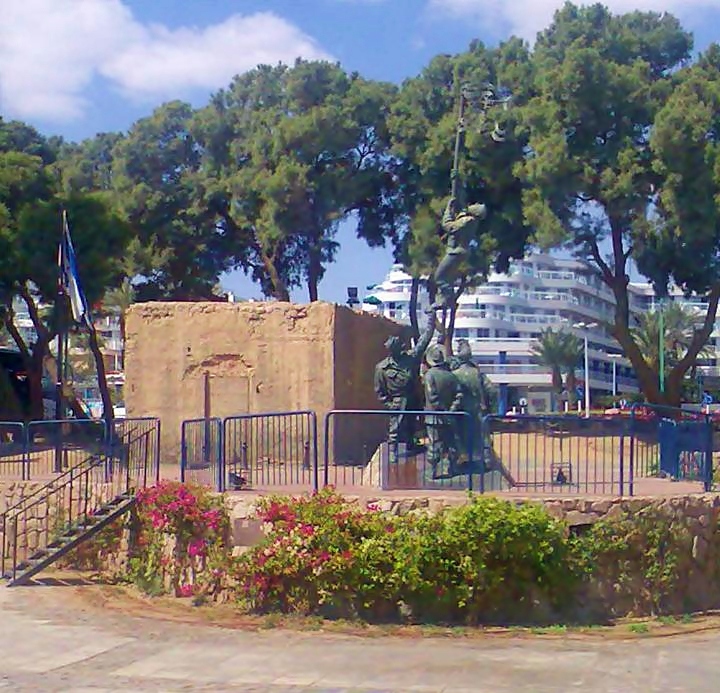 The photo below shows the monument of the famous flag raising. The city was established a year later in the area around the police station. Another view of the flag raising monument. Behind it is one of the original mud houses which was part of the British police station. The soldiers raised a makeshift Israeli flag, prepared from a shirt and ink, since they reached the site without a formal flag. The "ink flag" is a famous landmark and could be regarded as the cornerstone event of the modern city. After climbing up the western mountains, the road leads along the Egyptian border towards north. Along the road are different rock formations and color, belonging to various geological periods. 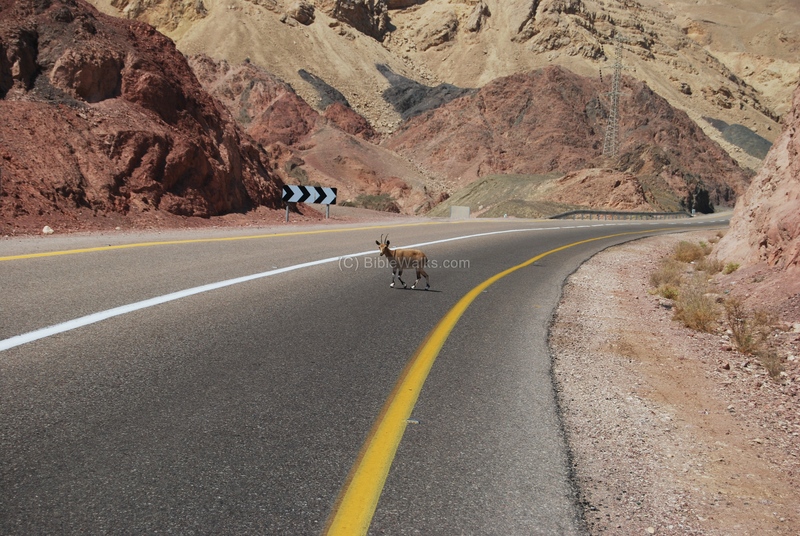 In the photo below an Ibex mountain goat (Ya'el) is seen crossing the road. 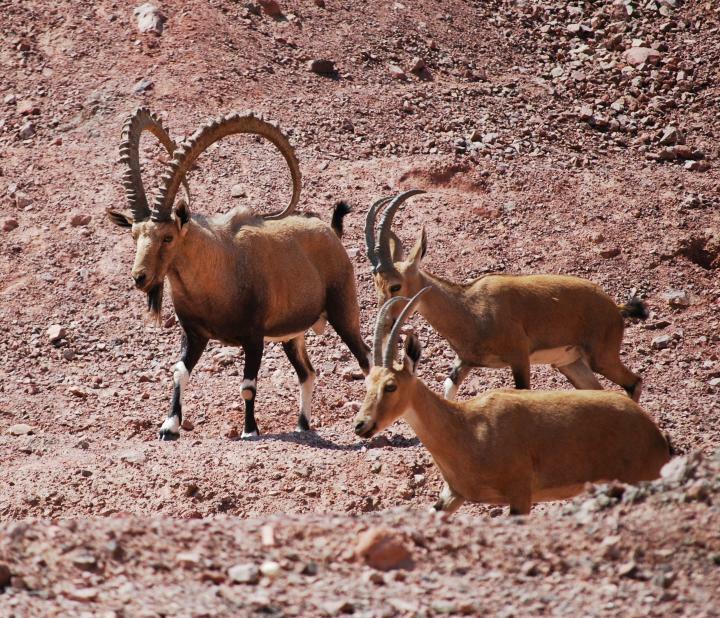 A male Ibex, accompanied by two females, is seen below. As in Psalms 104:18: "High mountains for ibex and rocks to shelter hyrax"
Another view of the Ibex mountain goat. 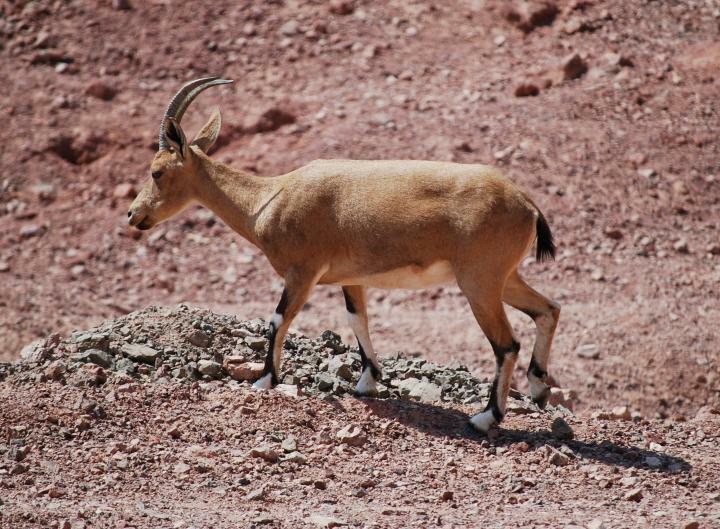 You can explore the mountain area by joining a jeep tour or ride on camels. Eilat and the Arava are one of the two major migration paths for birds between Europe and Africa. 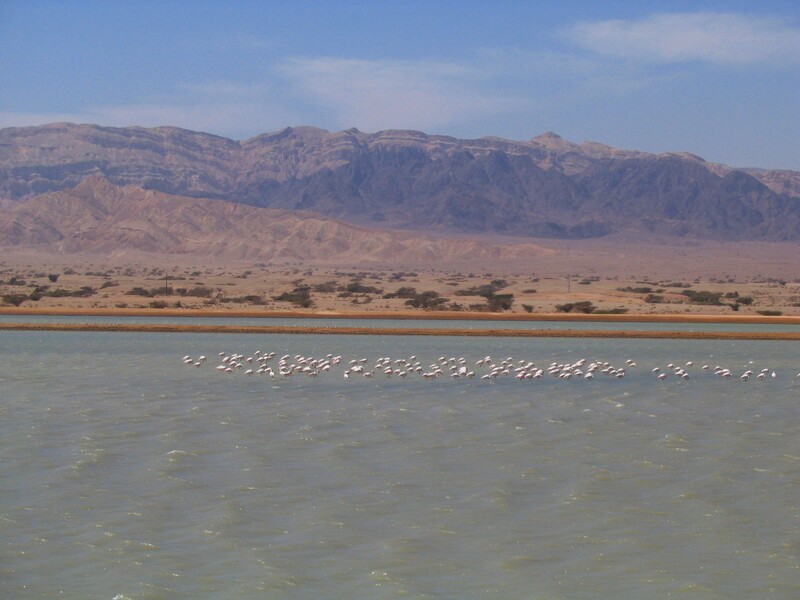 North of Eilat, just after the customs checkpoint, is a detour to the salt pools. This is a unique viewpoint for a flock of several hundred Flamingos who spend here the winter time. The mountains in the photo below, behind the pools, are the Edom mountains of Jordan. The vast valley - Arava - is the path of the Israelite exodus (Deuteronomy 2 8: "through the way of the plain from Elath"). "And when we passed by from our brethren the children of Esau, which dwelt in Seir, through the way of the plain from Elath, and from Eziongaber, we turned and passed by the way of the wilderness of Moab". King Solomon (~968-928BC) made Eilat and the city of Ezion-Geber a major port, and established maritime commerce with Ophir and Tharshish. "And king Solomon made a navy of ships in Eziongeber, which is beside Eloth, on the shore of the Red sea, in the land of Edom. And Hiram sent in the navy his servants, shipmen that had knowledge of the sea, with the servants of Solomon. And they came to Ophir, and fetched from thence gold, four hundred and twenty talents, and brought it to king Solomon". "For the king had at sea a navy of Tharshish with the navy of Hiram: once in three years came the navy of Tharshish, bringing gold, and silver, ivory, and apes, and peacocks". "Jehoshaphat made ships of Tharshish to go to Ophir for gold: but they went not; for the ships were broken at Eziongeber. Then said Ahaziah the son of Ahab unto Jehoshaphat, Let my servants go with thy servants in the ships. But Jehoshaphat would not.". "Then all the people of Judah took Uzziah, who was sixteen years old, and made him king in the room of his father Amaziah. He built Eloth, and restored it to Judah." "At that time Rezin king of Syria recovered Elath to Syria, and drave the Jews from Elath: and the Syrians came to Elath, and dwelt there unto this day". "Moreover, the king built many ships in the Egyptian Bay of the Red Sea, in a certain place called Ezion-geber: it is now called Berenice, and is not far from the city Eloth"
"...and when the king of Syria had taken the city Elath, upon the Red Sea, and had slain the inhabitants, he peopled it with Syrians; and when he had slain those in the [other] garrisons, and the Jews in their neighborhood, and had driven away much prey, he returned with his army back to Damascus". 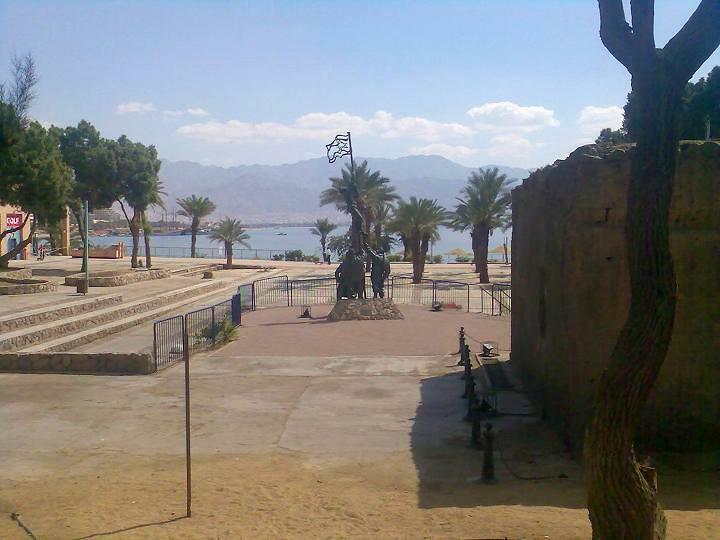 Eilat - the name of the Biblical city may have been based on the Pistacia (Hebrew: Ella) tree. It is mentioned in several Biblical sources. 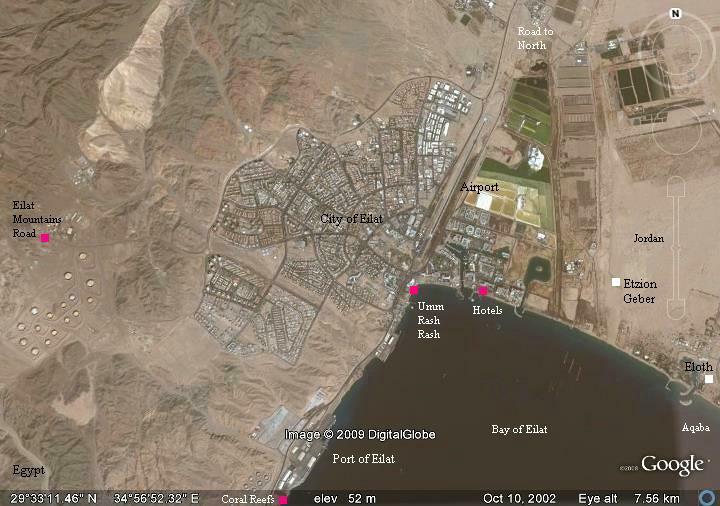 Etzion-Geber or just Etzion- The name of the ancient sea port near Eilat. Its meaning is not clear but may be based on the following words: Etzion - may mean "city"; Gever - In Hebrew means "Man" or "Rooster". 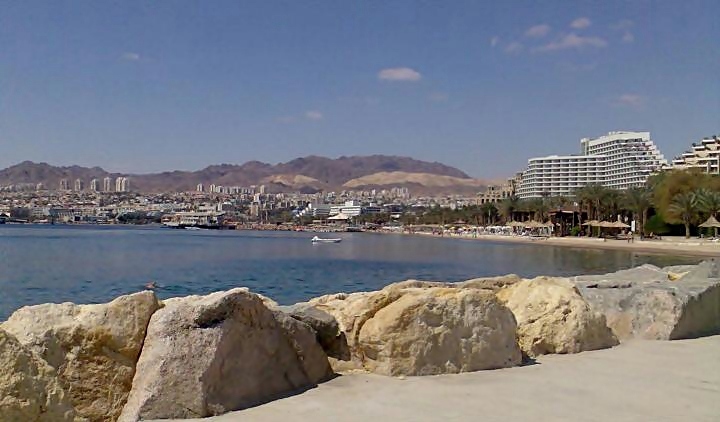 Aqaba (Akaba) - the Jordanian city, established by the Malukes near the ancient city of Eloth. It is a short form of Aqabah El Aila - Arabic for the "hillside of Eilat". Umm Rash-Rash - unknown source. Umm is "Mother" in Arabic.